A Russian Soyuz booster carrying a crew of three and an Olympic torch, the centerpiece of an out-of-this-world relay heralding the 2014 Winter Games in Sochi, Russia, streaked into orbit Wednesday, docking with the International Space Station early Thursday after a four-orbit rendezvous. With commander Mikhail Tyurin at the controls, flanked on the left by NASA flight engineer Rick Mastracchio and on the right by Japanese astronaut Koichi Wakata, the Soyuz TMA-11M spacecraft lifted off from the Baikonur Cosmodrome in Kazakhstan at 11:14:15 p.m. EST (GMT-5; 10:14 a.m. Thursday local time). Six hours and 13 minutes later, the spacecraft completed an automated rendezvous, gliding to a smooth docking at the station's Rassvet module at 5:27 a.m.
After verifying a tight seal between the two spacecraft, hatches were opened and Tyurin, grinning broadly, floated into the lab complex and handed the torch off to station commander Fyodor Yurchikhin before sharing an enthusiastic handshake and hug. 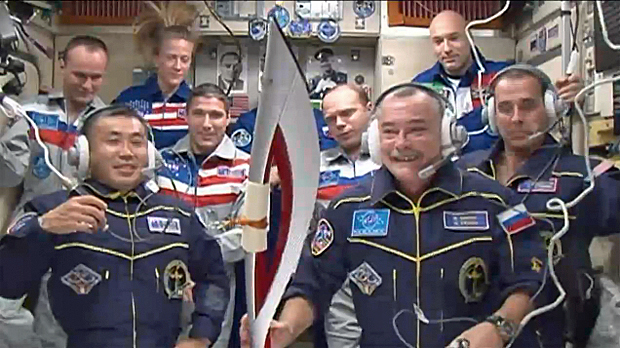 "Here you have the Olympic torch in the Russian segment of the International Space Station!" one of the cosmonauts radioed a few moments later as the combined crew gathered in the Zvezda command module. In a departure from normal practice, the Soyuz launch schedule was juggled to get the torch to the space station and quickly back to Earth as part of a high-profile relay leading up to the opening ceremony of the Winter Games in February. 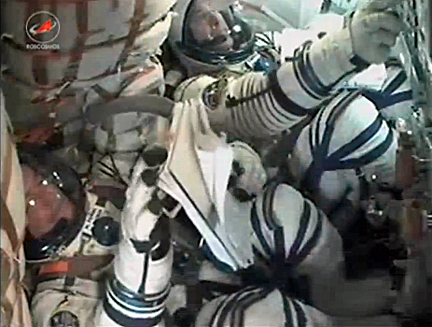 As a result, the Soyuz TMA-11M crew launched Wednesday boosted the lab's crew to nine instead of six as is the usual procedure, only the third time in station history that three Soyuz crews have been aboard at the same time. Welcoming the new additions aboard were Soyuz TMA-10M commander Oleg Kotov, Michael Hopkins and Sergey Ryazanskiy, launched Sept. 25, and Soyuz TMA-09M commander Yurchikhin, flight engineer Luca Parmitano and Karen Nyberg, who were launched May 28 and are closing out a long-duration stay in space. "It's great to be here, it was a great ride, and we're happy to join the crew," Mastracchio radioed in a brief video chat with friends and family in Baikonur. "It's good to see you, you look good," his wife, Candace, replied from the launch site. "That was a pretty sweet way to get out of the parking lot! The crew, everyone looks great." "It's great to hear from you," Mastracchio replied. "I'll see you soon, well, maybe not too soon. Tell the kids I said hi." The combined crews plan to participate in news conference Friday. The next day, Kotov and Ryazanskiy will take the Olympic torch outside at the start of an otherwise routine Russian maintenance spacewalk for a high-flying photo op to publicize the winter games. "It's great to be a small part of the Olympics," Mastracchio said in a pre-launch interview. "We'll hand off the Olympic torch to the Soyuz 10 crew, who will then take it out on a spacewalk. They'll then come back from the spacewalk, hand it to the Soyuz 9 crew and they will return it to Earth about five days after we arrive on the space station. So it's kind of like our own little relay with the torch on orbit." The day after the spacewalk, Yurchikhin, Parmitano and Nyberg plan to board their Soyuz TMA-09M ferry craft and undock from the Zvezda command module's aft port at 6:26 p.m. Landing on the steppe of Kazakhstan is expected around 9:50 p.m. The torch then will be handed off to Olympic organizers for use in the opening ceremonies of the February games. For Mastracchio, who logged 40 days in space during three space shuttle missions, launching aboard a Soyuz and having the opportunity to fly in the left seat, essentially the co-pilot's position, is a long-awaited opportunity. "It's very, very challenging," he said. "Being an engineer, I have the skills to learn how to fly a vehicle and how to operate a vehicle, but the language skill was very challenging for me. It's not as easy as it sounds to fly a spacecraft while speaking a foreign language! Again, a big challenge, which made it very interesting to me." Asked how his family viewed the risk of flying aboard a Soyuz compared to the space shuttle, Mastracchio said "I think they believe what I believe, which is the Soyuz is a very reliable vehicle. The Russians have been flying the Soyuz since the late '60s, it's been very successful, I feel very confident we'll have a safe and successful mission. And I believe they think the same." Mastracchio is flying with extremely experienced crewmates. Tyurin is a veteran of two long-duration stays aboard the International Space Station with a total of 344 days in space. Wakata has logged 160 days in space during two shuttle missions and a long-duration stay aboard the station. In a major first for Japan, Wakata will become commander of the space station next year after Kotov, Ryazanskiy and Hopkins depart. "It means a lot to Japan to have its own representative to command the International Space Station," Wakata said. "It's a big milestone for Japanese human space exploration to have this experience. Hopefully, we, Japan, will be able to be an essential partner of future human space program beyond low-Earth orbit. So I think it's a big milestone for Japan." Mastracchio described Wakata as "a very smart astronaut, he's a very friendly guy, very capable, a very hard worker." "But I think the thing that makes Koichi commander material is he knows he has a very talented team working with him and he lets us do our job. He's not only the commander, but he's also one of the workers, working right along side us to do all the tasks we need to do to accomplish the mission." As for Tyurin, Mastracchio said "he's great to work with. He and I work well together, we've been training together for more than a year, a year and a half, and we've really created a good team with us and Koichi." Asked what he's looking forward ￼to the most during his first extended mission, Mastracchio said having time to simply enjoy the experience is at the top of his list. "Space shuttle missions are two-week sprints where we know exactly everything we're going to have to do from day one until landing," he said. "And we practice and practice that, we work very hard and get very little free time. "So what I'm really looking forward to is living on board the space station for a long period of time where I may even have days where I have very little work to do and I can look out the window and just kind of enjoy living in space. I'm really looking forward to that. "And of course, the other thing is the research. I'm really looking forward to working with the scientists ... where I'll be on orbit kind of as (a) lab assistant, if you will, working on the experiment, putting his samples into the testing equipment and things like that. I'm really looking forward to that, building that relationship with the scientists on the ground." 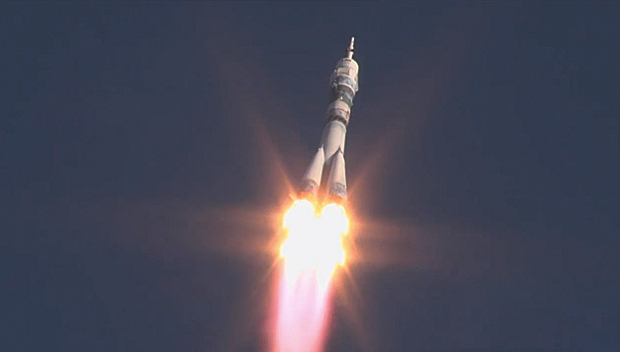 Tyurin, Mastracchio and Wakata plan to stay in space until May 14. In the near term, they expect cargo deliveries from a Russian Progress supply ship later this month, followed by arrival of an Orbital Sciences Corp. commercial Cygnus cargo craft in mid December. Another Progress is expected in early February followed about a week later by a commercial SpaceX Dragon cargo vehicle. Kotov, Ryazanskiy and Hopkins plan to return to Earth around March 12, leaving the station in the hands of Wakata, Tyurin and Mastracchio. On March 26, three fresh crew members -- Soyuz TMA-12M commander Alexander Skvortsov, Oleg Artemyev and Steve Swanson -- are scheduled for launch to boost the lab's crew back to six. One more Progress and two more commercial cargo ships are scheduled to arrive in April and May before Tyurin, Mastracchio and Wakata depart and return to Earth to close out a 188-day mission. "It's interesting, because the first time I went to the International Space Station was in 2000," Mastracchio said in a pre-launch briefing. "It was a brand new space station, when I arrived there nobody was living there, there were only three modules, it had that new space station smell. "I came back in 2007, there were three folks living there, we had completed most of the truss work on the space station, we'd added the U.S. laboratory and the airlock. I got to do three spacewalks, help assemble the space station, and then I went back again in 2010, six people were living there, all the modules had been added. "So every time I go there, the space station gets bigger and bigger and more and more people," he said. "Now I'm going there for the fourth time, but this time I'm not going there to help assemble the space station but to live and work aboard the space station. So I'm really looking forward to actually spending a long period of time up there, helping to do some research, get involved in the science, actually use the space station for what it was intended to be used for."